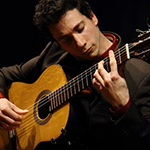 A native of St. Petersburg, Russia, Grisha Goryachev is renowned for his extraordinary musical sensitivity and technical virtuosity in both classical and flamenco styles. He is reviving the tradition of solo flamenco guitar in a concert setting that was practiced by the legendary flamenco masters Ramón Montoya and Sabicas. Goryachev will be playing flamenco compositions by modern and traditional maestros, each with different colors of beauty, intensity, stretching the guitar to express all of its capable emotions.